TO ALL THOSE who think they know their parents, I must offer this story. Before writing A Letter from Frank I believed I understood my father. He was, after all, one of the most influential people in my life. So it was with tremendous surprise in 2007 that I happened to read a letter he had received long ago. It was remarkable that letter had survived, having been moved from one residence to another as addresses changed more than a dozen times. Far more remarkable was that it revealed something completely unknown about my father. That letter began a journey to re-examine how well I actually knew my father. He had died in 1986 when I was 31. What I found nearly twenty five years after his death astounded me. It also led me to meet the writer of that letter. Sent in the late 1940s to Russ, signed only "Frank" and with no return address, it was clear the letter's author wrote from post-war Germany, and that he and my father had met when they were both soldiers at the end of the war. A Letter from Frank tells three intertwined stories. It is Russ's story, growing up during the Depression and serving as a volunteer in the Canadian army. It is also Frank's memoir - remarkably, I found Frank, now in his 80s and living in Berlin. He too volunteered, joining the Luftwaffe in 1940 at the age of 17. Thirdly, this book tells the modern story of my search for Frank and coming to terms with how the war had changed my father. 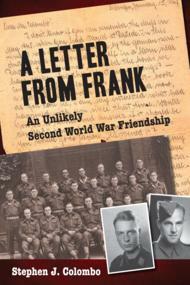 The stories of Russ and Frank and my journey became the book A Letter from Frank, published by Dundurn Press in 2011. Write to author@aletterfromfrank.com to comment on this website or to contact the author. The Globe and Mail's coverage of A Letter From Frank included a feature story (see Surrender of German paratrooper to Canadian yielded an unlikely bond) and a selection of photographs. The Toronto Sun's article by Lance Hornsby about A Letter From Frank can be found here. Frank Sikora (right) in 2012. Sirius Satellite channel NHL Center Ice interview with the author can be heard here. "...a story that is personal, touching and illuminating." "The story of the letter and how the author found Frank is remarkable"
"I consider a book a good read when it stays with me after I have read it. This is one of those books." "Brings to life the drama and emotions of what it was like for men to go through the Great Depression followed by World War II and then come home to try and lead a normal life." "A perspective that is not normally provided in accounts of this very important period of time that is still affecting our lives." "I will definitely encourage my teenage son to read it, and will also give a copy to my father-in-law, a war veteran himself. I am certain they will both become engrossed in this true story." Click on the image to find out how to buy this book. Dundurn Press has many fine books whose subject is the Second World War. Recollections of WWII - a blog to bring attention to WWII memoirs. A website dedicated to the Royal Canadian Army Service Corps (RCASC). They provided every drop of fuel and round of ammunition needed to keep the Fourth Canadian Armoured Division moving.